Last weekend, Carol and I were set up at a local antique show. We were there for two days and were among about forty dealers participating in the show. The crowds were decent and we really can’t complain about how we did. Being there two days also gave us lots of time to check out what the other dealers had to sell as well. When we are selling I get in what I call a “selling mode” which means I’m not much in a “buying mode”. Nevertheless, I wasn’t about to come home empty handed. I ended up purchasing this copper lustre pitcher from a fellow dealer for twenty dollars. It was the second day of the show and he dropped the price from thirty dollars to move it along. I liked the hand painted decoration on both sides of what appears to be a mother teaching her daughter how to write. Perhaps it’s supposed to be the Bronte sisters. I don’t really know but it’s always nice to speculate. 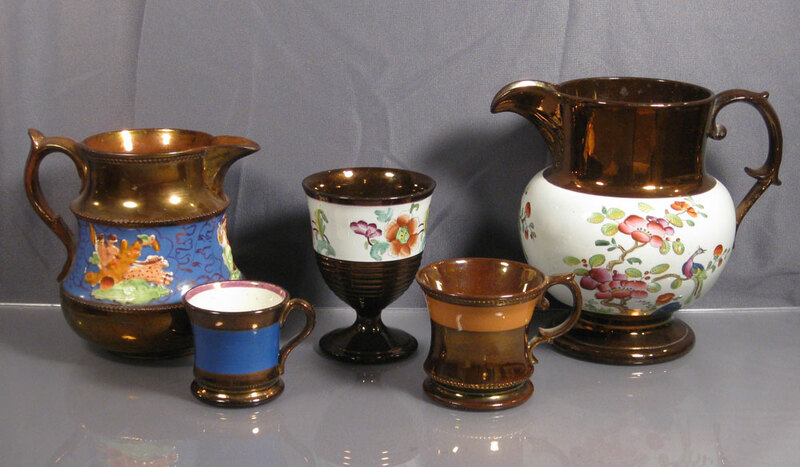 Copper Lustre was made in the Staffordshire district of England from about 1820 to about 1860 when it fell out of fashion. A lot of it was shipped to the United States at that time so it isn’t unusual to find a piece or two at your local flea market or antique shop. Unfortunately it seems to have fallen out of fashion with modern collectors as well. Consequently when you do find it these days it’s really cheap, which is kind of sad. So why did I buy something that nobody else seems to be buying right now? First, I like it. Second, it was cheap. Third, it can only go up over time. Fourth, think of the history it represents. The piece I bought was probably made in a factory at the very earliest stages of the Industrial Revolution. Perhaps the person who decorated it lived in a cottage with a thatched roof. Queen Victoria may not have even been Queen when it was made. It would have been shipped by horse and wagon to a nearby port where it would have been loaded onto a sailing ship and sent to a still young America. The twenty dollar bill I purchased it with had the picture of Andrew Jackson on it, who could have been our President at the time it was made. The great westward expansion and Civil War were still to come and slavery had yet to be abolished. Somehow this little pitcher survived all that in its one hundred and seventy or eighty years without any chips or cracks. Why wouldn’t I buy it! There was a saying back in the sixties that went “Do your own thing”. There is an opportunity out there right now to buy true antiques at affordable prices. I doubt it will be around forever. This entry was posted in 1800's, English, Foreign, Jim, Kitchen, Pottery. Bookmark the permalink. I have been in possession on a pitcher that belonged to my grandmother. 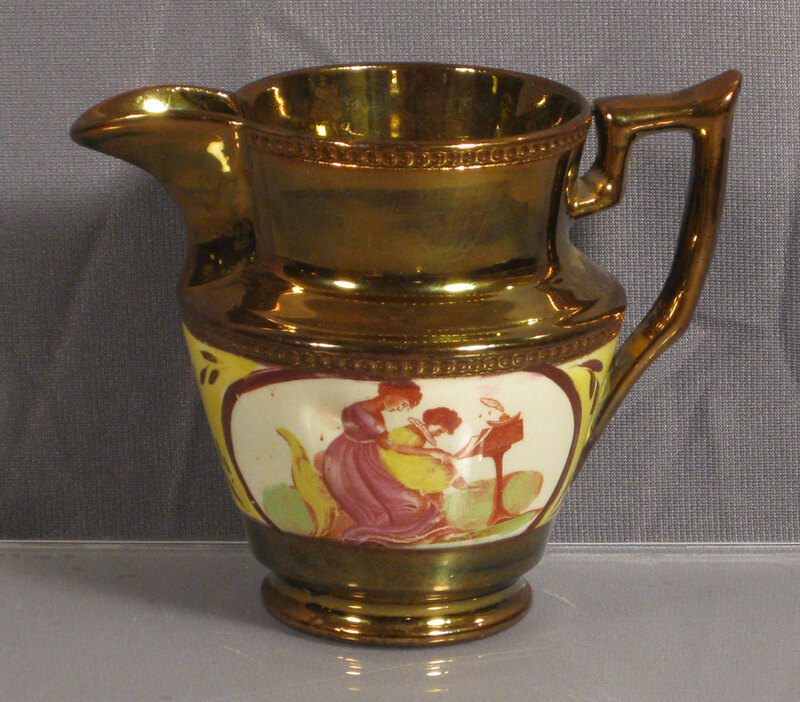 Your site is the best I have found that gives me any history of the Staffordshire Lustre Pitcher. 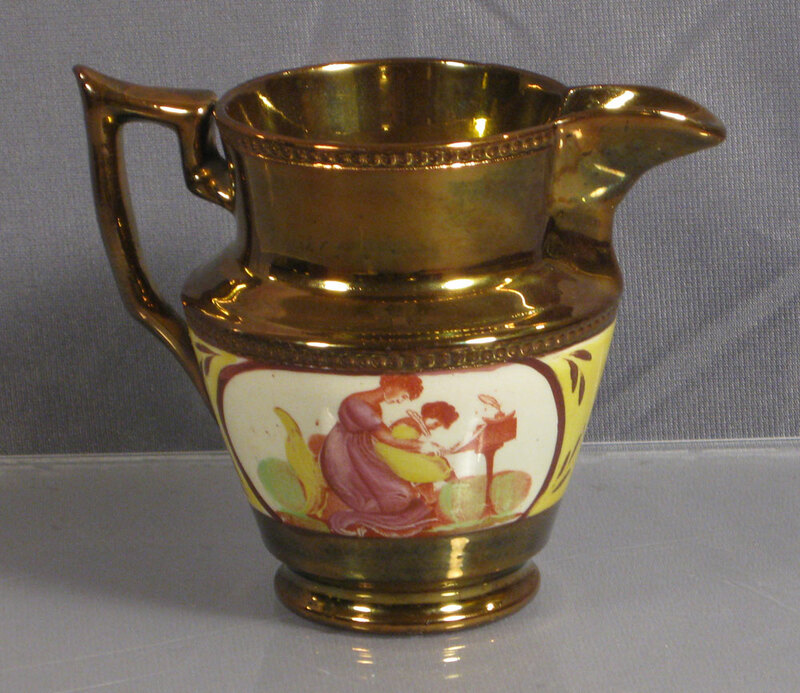 I am not in love with this pitcher, it has a blue band with cherubs hand painted. Because it had no markings it has been difficult to determine what it is. Your description makes me love this pitcher. Someone took the time to carefully paint those cherubs flying around the pitcher. I think I will love it forever now! So glad you love your pitcher now. As I often have said, what gives an antique value is more often what it represents than what it is. In this case it represents your family’s past and is a direct link between you and your grandmother – and possibly several generations before her.